The Quality Education Project (QEP) and Flip the Board are hosting a New Candidate Forum for all new candidates running for Charleston County School Board in November. Charleston, SC, August 23, 2018 — Local grassroots advocacy groups Flip the Board and Quality Education Project are hosting a “School Board New Candidate Forum” on September 6, at the International Longshoremen’s Hall (1142 Morrison Dr.) from 6:30–8:30 p.m. The forum will host a moderated panel featuring exclusively non-incumbent candidates for the four open seats on the Charleston County Consolidated School Board. Live5 news anchor, Michal Higdon will be moderating the forum. 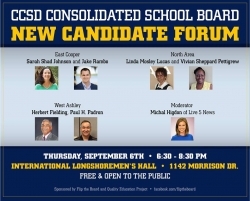 The School Board New Candidate Forum follows years of controversial debate and discussion about the dismal performance of many students in the Charleston County School district as the state of South Carolina is consistently ranked at or near the bottom of national rankings. Flip the Board and the co-sponsors firmly believe that electing new school board members throughout the entire county in November 2018 is a critical part of effective education reform. The forum is free and open to the public, including all parents and their children, teachers, and administrators. Please visit Facebook.com/FlipTheBoard for more information.